In the 1970’s Robert Greenleaf wrote “visions, both good and bad, can be contagious.” When was the last time you set a vision for yourself? your team? your organization? The exercise of casting a vision is a critical step in building the future you want. Casting smaller scale, mini-visions can build momentum even faster and become even more contagious. Mini-visions build the future you want. Let’s explore the concept of a mini-vision. I recently walked across the Golden Gate Bridge with two friends of mine that have set a courageous mini- vision for their careers. This mini- vision is not at all their final career goal. Yet, they are stepping boldly into an opportunity and seeing where this mini-vision will take them. Walking behind them, I found myself getting swept up by the symbolic nature of the bridge and their mini-vision. 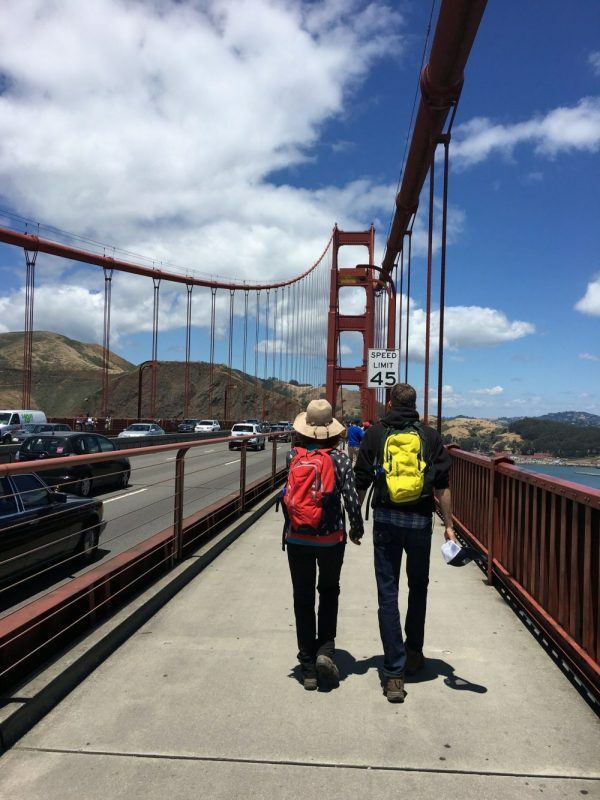 As they walked across the span of the bridge with their backpacks, I admired their courage, sense of adventure, and ability to step out into an unknown future. Their mini-vision was and will be a contagious vision for all who cross their path. In another example, a colleague of mine recently stepped down from her position so she could spend the summer with her family. Her mini- vision was clear. She knew that the years with her teenage kids at home was rapidly coming to a close. She could see college and summer jobs on the horizon. She cast a mini- vision of spending more time with family for summer 2017 and it quickly became contagious. Her husband and kids have all embraced the vision of adventures, fun and relaxing together this summer. What would a mini- vision look like in an group? In organizations, vision writing is often dreaded as it can be a long drawn out process of word smithing. However, when we set mini-visions nested within the larger vision, things rapidly shift. A simple first step to integrating mini visions is with a mini-vision meeting strategy. A non-profit Board meeting that sets a mini-vision of ending the meeting with each board member having three specific donors to contact. A neighborhood meeting that casts a mini-vision of listening to every voice in the room to ensure a diversity of perspectives is heard. A faith community meeting that casts a mini-vision of pausing in silence to ensure there is space for quieter voices to emerge into the conversation. A department meeting that sees success as assigning action steps to each person in the room based on their strengths and interests. What could be different for your next meeting? Try adding this first agenda item for your meeting: “#1- Cast Mini Vision- What will success look like for us as a group?” Take the time to notice what is different just by aligning everyone around a vision of success first. Mini-Visions are contagious and they build momentum towards a greater goal and vision. What’s your mini-vision for today? this week? this summer?